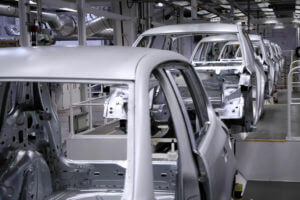 Adhesives play a critical role in maintaining a strong, durable bond in rubber to metal bonding. If the adhesive fails, the part will invariably fall. There are hundreds of causes for rubber to metal bond failures — all of which H.M. Royal has the tools and expertise to evaluate. Today, we are sharing the top 4 causes to help you troubleshoot existing failures and prevent recurrences. One of the leading causes of rubber to metal bond failures is using the wrong adhesive. Choosing an adhesive that is incompatible with the elastomer or substrate will cause performance issues or, worst-case scenario, complete bond failure. For the strongest, most durable bond, you must use an adhesive that is compatible with your materials. With so many rubber to metal bonding adhesives to choose from, it can be difficult to decide on the right adhesive for your application. Be sure to contact our material experts if you’re looking for a recommendation. In our experience, the majority of rubber to metal bond failures are due to improper handling, with the largest percentage caused by improper mixing. An improperly mixed adhesive will contain settled solids, often raw materials critical in the bonding process. Even a slight deviation from the appropriate mixing procedure can affect bond integrity. Not storing the adhesive properly is another cause of rubber to metal bond failures. Improper storage of unopened containers (e.g. storage in temperatures too high or low for the particular product), as well as improper storage of coated inserts (exposed to dust, humidity, high/low temperature, UV light, etc.) can all have an impact on bond integrity. To maximize the shelf life of your adhesive systems, you need to adhere to the storage directions on the product’s technical data sheet. It’s important to eliminate as many sources of contamination as possible in your process. Make sure that your storage, cleaning, surface preparation, and processing steps (e.g. molding with mold release) are optimized to prevent contamination. Processing methods are another source of rubber to metal bond failures. Molding and curing processes play an essential role in ensuring a strong, reliable and long-lasting bond. The method of molding or the temperature and amount of time a coated insert is cured for can have a direct impact on adhesion. Keep in mind that the adhesive should cure at the same time as the rubber. If the coated inserts are exposed to mold cure temperatures for an extended period of time before the rubber is introduced (what’s known as pre-bake), this could cause a failure. Bonded rubber components experience many stressors and environmental conditions that can cause bond failures in the field. Your part may be exposed to elevated temperatures for an extended period of time. Or it may suffer damage from a caustic agent or oil. Make sure you take any environmental factors into consideration before choosing an adhesive. That way, you can select the adhesive that is best suited for your application. We also recommend testing the integrity and reliability of the bond. With rubber to metal parts, the only way to evaluate bond strength is to destroy the part. Destructive testing will help to determine the quality of the bond. By taking the above factors into consideration, you can ensure your rubber to metal bond is strong enough for the application and its operating environment. H.M. Royal offers a variety of adhesives to suit your application needs, including a wide range of Dow Automotive rubber to metal adhesives. We also have our own laboratory capabilities and can help to support our customers. Let us know if you need help deciding on the best adhesive for your requirements.